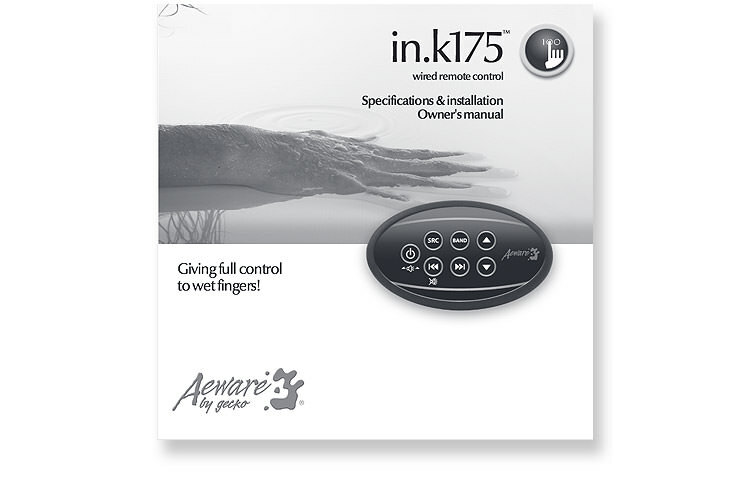 In.k175 audio & video wired remote control is a warranty of well designed electronic and mechanical components. We kept our promise of a full control of all audio functions at your fingertips! With its 7 well designed backlit keys, in.k175 is just as eye-pleasing as resistant. Also, knowing you can master your audio & video systems with in.k175 remote control will be music to your ears! Under a water resistant front panel and a black trim bezel has been wired an audio remote control that will soothe every music and spa amateurs. Featuring a sharp and simple design, in.k175 users can relie on a watertight assembly, a great resistance and an optimal durability. 2.15" x 0.2" x 3.58"
Pressing SRC allows you to select between these sources: Tuner, CD/DVD, CD changer and Auxiliary. Press the Band key to make a selection between the following: FM1, FM2, FM3, AM1 and AM2. In Radio mode, press Track Down to go to the previous station. In CD mode, this will skip to the previous track. In MP3 mode, you will get to the previous file, and In DVD mode, Track Down key will go to the next lower chapter. In Radio mode, press Track Up to go to the next station. In CD mode, this will change music track. In MP3 mode, pressing that key will select the upper file. In DVD mode, Track Down will get you to the next higher chapter. Press on « up » arrow to increase volume. Press on « down » arrow to decrease volume. Press the Power button to turn system on or off. Press 2 seconds on speaker icon to fade volume: FAD-FRONT: front speaker only. FAD-REAR: rear speaker only. FAD-ALL: front and rear speakers.